At the end of 2007, the Canon 5D had dropped to a price that seemed within my reach. To make up my mind, I rented a 5D over a weekend. This is not a scientific examination. This is not a full review. This is simply a user report from a dedicated hobbyist, normally shooting with a Pentax *ist DS. I will simply tell you how I experienced four days with the 5D and some of my M42 lenses and show you some photos and some test shots. My comments will be very subjective, but I try to keep them balanced. If you find factual errors, please notify me. I've been using a Pentax *ist DS for almost 60'000 shots now. It is small, sturdy, has one of the best viewfinders found in APS-C sensor cameras. The 5D on the other hand, is much larger, despite having not having an integrated flash. Its most obvious feature is the "full frame" sensor, meaning that it is as large as 135 film, namely roughly 36mm x 24mm. The difference in linear dimensions to the DS's 23.5mm x 15.7mm so-called APS-C sensor is the "format factor" of 1.53x (also called "crop factor", "focal multiplier" or "focal length multiplier"). This means the capturing area is actually 2.34 times larger. This means that lenses behave differently between the two cameras. Most people understand the effect on angle of view, but to understand the effects on noise and depth of field, I suggest you read through Joe's essay Equivalence. Both cameras aren't exactly "new" in the digital arena and interestingly, both cameras share a very similar sensel pitch (usually called pixel pitch). This means that after cropping the 12.8MP Canon to 6MP, like the Pentax *ist DS, the shots of the two cameras will almost match when shot at same focal length and aperture. 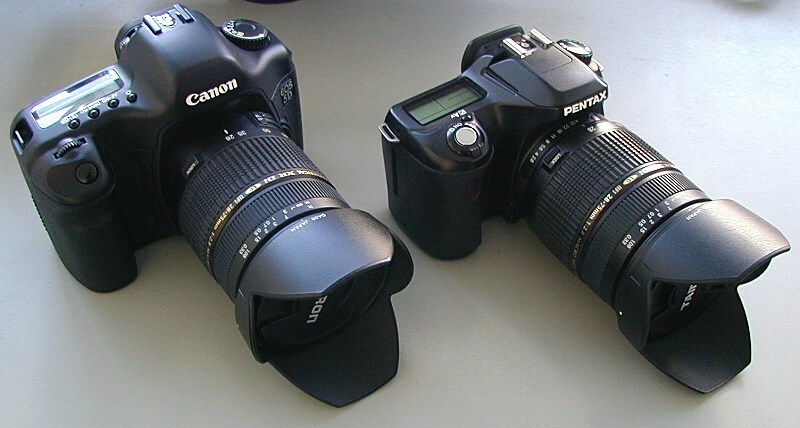 The Canon 5D has two control wheels, the DS only one. I found the round command dial on the back of the 5D to be very nice. Obviously, having two control wheels makes adjusting various settings much faster. The LCD screen of the 5D has a rather poor reputation. I found it a joy to use. The 5D does not offer fast access to drive modes like the Pentax does. On the Pentax, using the four way controller, you can quickly select them all independently. On the 5D, you need to dive into the menu to change from continuous to bracketing. On the positive side, the way to adjust the type of bracketing on the 5D is very nicely done. The implementation of mirror pre-flip (often unprecisely called "mirror lock up") on the 5D is a bad joke, not only requiring a trip into the menu, but even setting a custom function. The 5D supports a user mode, where these things can be stored. But as there is only one of them, I'd still prefer the Pentax way. On the plus side, the 5D allows changing AF mode quickly without menus. On the 5D, my nose would often activate the menu by pushing the button. The Pentax uses an on/off switch that doubles as DOF preview around the shutter release. The on/off switch of the Canon sits at the back of the camera and doubles as a lock for the rear command dial to prevent accidental (or intended) change of settings. I prefer the ergonomy of the Pentax. But both cameras have an auto-stand-by setting and wake up quickly from sleep, so this is rarely a real issue. The viewfinder is neither much brighter nor much larger than on the DS. But combined, it is much nicer. The stock focus screen of the 5D seems a little bit worse for manual focus, but this is equalized by the nicer viewfinder on the Canon. Review and browsing through shots is faster on the 5D. It loads a low-res preview first to speed up the browsing. Then a higher-res preview gets loaded. When you turn the command dial quickly and stop suddenly, the image browsing lags a bit behind, which is annoying until you get a feel for it. Automatic white balance (AWB) on the 5D seemed to be unreliable. While Pentax's AWB just does nothing, the 5D implementation did the wrong thing sometimes. As I was shooting RAW, I didn't bother. The presets on the 5D are good and the custom WB is very nice. The Auto-ISO on the DS is imperfect, as it gets disabled when exposure compensation is activated. The Auto ISO on the 5D can only be used in "idiot mode". Isn't it interesting that automatic modes are the norm for shutter speed and aperture, but not for the artistically much less important ISO? Newer Canon and Pentax cameras now support a better implementation of Auto ISO. The 5D lets you change ISO and see it in the viewfinder, which is better than the DS's way. Modern Pentax dSLRs now show ISO, at the least when changing it. Selecting the AF points is done via the four way controller on the Pentax and by either of the two wheels on the 5D. The Canon also offers the possibility to select with the four way controller. Initially I found that hard to use with one eye on the viewfinder, but it became quite easy to reach with average size hands. Canon does display the selected AF point on the top LCD. Which has a "light me" button, BTW. AF on the 5D is nice and fast. I didn't notice any of the alledged problems with the one AF lens (Tamron 28-75/2.8) I had available. In fact, focus was just about perfect. My only issue with the AF on the 5D is that the focus points aren't spread out as far as I'd like. This means that you'll do the "focus-recompose" more often. I was told that the 5D uses the same AF engine as the 20D. If that is true, it explains the narrower coverage on full-frame. When I got my DS, I initially had problems holding it over a longer period of time. I don't have that problem anymore. The 5D is noticably larger, but does feel nice in my hands and I had no problems holding it for quite some time. I don't use neckstraps usually, so that is important for me. I like compact cameras, but the 5D handles so nicely, I can't really dislike it. Its size or weight might become a problem for small backpacks or longer hikes. I rented the 5D with the Tamron 28-75/2.8. A lens that I like on my DS and which has been recommended to me by Joe. I know there are sharper lenses out there, but I wanted to keep a realistic budget. If I'd buy the 5D, the Tamron would be my choice and I would think about using my old M42 glass until I feel I need another AF lens. Well, I used it a quite a bit and I was pleasantly surprised. As the equivalent lens on APS-C would be a 13mm/1.83 I think the performance is respectable for a ~40 year old design. There are some crops on page II of this non-review. Barely used it. Its focal length didn't come into play. The few shots I did showed a solid performance right into the corners. Again, not much use. Low contrast and resolution at f/1.4, but getting very good at f/2, with nice rendering. You know the story. Quite some use, very nice. Slightly low contrast wide open, very nice from f/2.8 on. This saw heavy use, sweet lens. With this lens, even more than with the others, I was reminded of the poor flare resistance without a proper lens hood. While both of the Soligor/Tokina C/D lenses have an integrated lens hood, it is too short for difficult lighting. This is not sensor-specific, but still worth to keep in mind. The only modern lens and the only zoom lens I had with me. I can't fault its performance. It is a bit softish at 28/2.8 in the corners, but considering that an equivalent lens would be an 18-50/1.83, I don't really mind. Actually, I'm very impressed. The only think that bugged me: It is a bit too wide for me. I use it on my DS, where it behaves like a 42-113mm lens - ideal portrait lens. Ah, well. You can't have all. As expected, the bright lenses coupled with the low-noise sensor allowed me to achieve shallower DOF and lower noise. When deep DOF was asked for, increasing the ISO and stopping the lens one stop down did the trick to copy the appearance of APS-C. Equivalence at work. Sweet camera! I would most certainly buy it, if it wasn't for the cumbersome and expensive system change. Using my old bright M42 glass was fun and gave pleasing results (for me). As it seems, a full-frame camera by Pentax is highly unlikely. After these four days, I bemoan this even more. A 5D successor is expected for spring 2008, as is a new APS-C camera by Pentax. I'll see what I'll do.